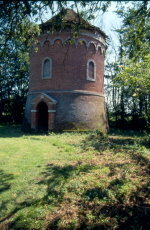 The study of historic dovecotes in Britain has been bedevilled by a few historical fallacies which appeared in the early literature, before they were fully understood. 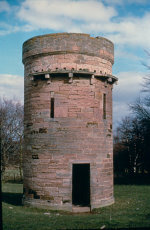 They were widely disseminated by Arthur O. Cooke in his introductory work ‘A Book of Dovecotes’, published in 1920, but they were originated by the earliest writers to take an interest in the subject, R. S. Ferguson, who wrote in 1887, and Alfred Watkins (he of the ‘ley lines‘), who wrote in 1890. They have been copied over and over again by later writers who have not taken the trouble to study the historical evidence for themselves. What was a dovecote for? The first of these fallacies concerns the essential function of the dovecote. Dovecotes were built by wealthy people to supply themselves and their households with a luxurious food, the tender meat of young pigeons. A pair of dovecote pigeons produced a clutch of two eggs, which they incubated for seventeen days. Then the young were fed by both parents with regurgitated liquid food (‘pigeons’ milk‘), and they grew rapidly. By the age of four weeks they were ready to fly. In nature the parent birds would then drive them from the nest. In domestication the pigeon-keeper ‘searched’ the dovecote for ‘squabs‘, the young birds which were almost fully developed, and wrung their necks. A servant 'searches' a dovecote of the type which was common in inn-yards, and hands the young pigeons down to the woman below. (From Microcosm by W. H. Pyne, published in 1805, by courtesy of the British Library). At that stage they were almost as large as the parent birds but their flying muscles had never been used; consequently their meat was very tender, and was much prized as a delicacy. Squabs could be roasted on spits or baked with other delicacies. As dovecotes were always associated with a luxurious way of life they came to symbolize high social status - or high social aspirations. For this reason they were prominently situated, usually near the main entrance road to the house. 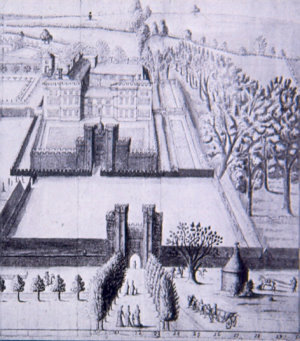 c.1670-80. The dovecote is at bottom right. Pigeon meat was NOT available throughout the year, contrary to the much-stated belief. The first squabs of the year were hatched early in March, and would have been ready for eating 3 - 4 weeks later if Lent had not intervened. For forty days before Easter religious custom forbade the eating of meat. (The earliest possible date for Easter is 22 March, but that occurs only once a century; three times out of four Easter occurs in April). Household accounts from all periods show that pigeons first appeared on the table on Easter Sunday. (Any squabs which matured during Lent were allowed to survive as breeding stock). 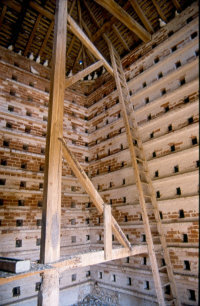 Large quantities of young pigeons were taken from the dovecote for eating during April and May, then the supply dipped until August, September and October, when most young pigeons were produced. This seasonal fluctuation is clearly shown in the accounts of Dame Alice de Bryene of Acton, Suffolk, for 1412-3. Her household of about twenty persons ate 100 pigeons in April, 239 in May, 54 in June, 54 in July, 336 in August, 340 in September, 275 in October, and 147 in November. No more pigeons were eaten in December, January or February, and only 4 in March. Every other set of household accounts from the thirteenth century to the eighteenth century confirms this seasonal pattern. This is contrary to what Arthur Cooke and those who have copied from him have written, but it is the truth - as anyone may confirm who examines the contemporary evidence. Some early household accounts are published and are easily available; those of the Bishop of Hereford for 1289-90 have been in print since 1855. It is true that pigeons can breed in winter. In any large population of dovecote pigeons a few pairs would produce squabs in the winter months. This phenomenon is of great interest to ornithologists because it is so rare among bird species; but as a food supply the quantity was negligible. The few squabs produced in winter could be sold for very high prices, as a delicacy out of season - e.g. in 1634 the Earl of Salisbury paid four times the normal price for winter squabs - but the Earl was one of the richest men in England. 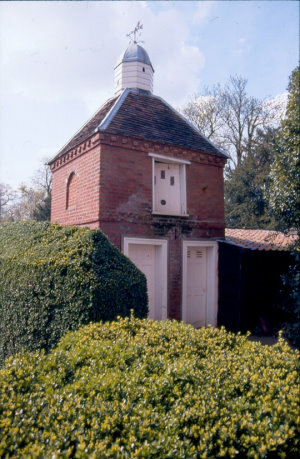 Most of the wealthy householders who could afford to keep a dovecote had to be content with what it could produce, and accepted that pigeons were not available between November and Easter. The mature birds were not eaten at all - at least by the owners of the dovecotes. Una Robertson has studied Scottish household accounts of the eighteenth century, and has found that the old birds were given to employees. W. M. Levi, an American pigeon breeder, has confirmed that the mature birds are so tough as to be almost useless: ‘It is a problem to dispose of these old birds . . . The price paid for such birds is so small that it hardly warrants the breeder to figure on an income from them’. He added that old birds could be made edible by steaming them for two hours before roasting, or stewing them for even longer. In traditional usage the mature pigeons were not thought worth eating. Another common misconception is that fresh meat was not available in winter until the so-called ‘turnip revolution’ of the eighteenth century. On the contrary, household accounts of all periods show that the gentry and upper classes ate far more fresh meat all the year round than would be considered healthy today. That included senior clerics and their households, abbots and priors of monasteries and their guests, all Court officials, and most lords of manors. For instance, in the depth of winter, on 2 January 1290 the Bishop of Hereford and his household of about forty persons ate beef, pork, veal, venison and mutton, all freshly killed, in addition to ham, rabbits, hares, chickens and wildfowl! The accounts of Sir Richard Reynell of Newton Abbot, Devon, for 1627-8 specifically state that sheep or cattle were killed to supply his kitchen in every month of the year. At all periods fresh meat has been available in winter, but it was expensive. Only the rich owned dovecotes, but the rich had the best of everything. Oh, not those turnips again! It is true that the introduction of root crops for fodder enabled farmers to produce more meat than ever before. This revolution in animal husbandry was introduced to Britain from the Low Countries in 1651, was widely practised in East Anglia by the 1680s, and was generally adopted in the early eighteenth century. Arthur Cooke wrote that the introduction of turnips as a fodder crop effectively brought about the end of dovecotes. That is nonsense. Turnips never had anything to do with the history of dovecotes. 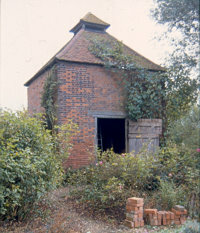 More dovecotes were in use by the late eighteenth century than ever before. New dovecotes continued to be built, and old ones were improved, right up to the last few years of the century. What happened was that in 1793 the French Revolutionary Wars began, which lasted until 1815. As any farmer will confirm, war brings prosperity to the farm. The price of wheat doubled, and by 1812 it had tripled. In 1796 the Board of Agriculture was formed, which encouraged the landed gentry and their tenant farmers to adopt all the latest scientific practices of 'progressive agriculture', and to increase their production of profitable cereals and meat. It had long been known that dovecotes were uneconomic from a national point of view, in that they produced a luxury for the few at the cost of holding back more efficient farming by the many. The progressive writers - many of whom were Scottish land agents - insisted that dovecote pigeons wasted valuable cereals, in addition to damaging the thatch of buildings. One described pigeons as 'voracious and insatiate vermin'. Another wrote: 'The injury done by them on the crops . . . more than counterbalances any advantage from their manure, or from themselves as food'. Dovecotes ceased to be a matter of pride, and became socially unacceptable. Many were demolished, others were allowed to fall derelict. into a gig-house, later into a garage. ................................. has been converted into a stable. 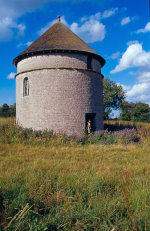 Outside the regions devoted to pastoral farming few dovecotes survived the Napoleonic Wars without conversion; but in some places - Herefordshire and Nottinghamshire for example - they continued in use longer. After the wars there was a partial revival, but it did not last. By the middle of the nineteenth century other developments in farming, and changes in the law, had effectively put an end to dovecotes. The oral tradition of how they had been used was lost - which is why the antiquarian writers who first became interested in them from 1887 had so little information. Arthur Cooke became thoroughly confused about the word ‘vermin’, which he assumed always meant rats. 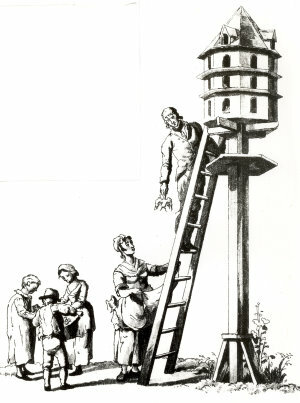 The users of early dovecotes were mainly concerned about losses to birds of prey, which they described as vermin. They were also concerned about polecats and martens, which could climb the corners of some dovecotes, enter at the eaves and prey on the pigeons and their eggs, so these too were described as vermin. Until the middle of the eighteenth century rats did not constitute a problem for pigeon-keepers, for the simple reason that the only rats in Britain were black rats, Rattus rattus, a fruit-eating and seed-eating species which did no harm to livestock. 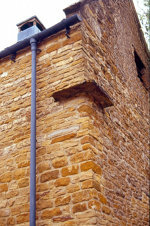 The ledges which are found high on some early dovecotes had nothing to do with rats. They were provided for pigeons to perch on and sun themselves while sheltering from strong wind, and are correctly described as ‘perching ledges’. They are found on dovecotes in windy places - Scotland, Northumberland, and at exposed sites near the coast, but they are not at all common on inland dovecotes further south. Careful observation of where a ledge is situated on the building will usually prove that it had no protective function against rats. Where there is a window aperture below the ledge, as often there is, this must be obvious. Many of these ledges do not even encircle the building. The word 'rat-ledge' did not exist before the twentieth century. But when brown rats arrived . . . .
A new situation arose in the eighteenth century when brown rats, Rattus norvegicus, were brought to Britain by timber ships from the Baltic. These are the rats we know today; black rats have since become extinct. Brown rats entered the country at the port of London about 1730. Because they are natural waterside feeders they spread rapidly up the River Thames and its tributaries, and from there along ditches and drains. Also, they were carried from port to port by coastal shipping. Before long they had become a plague everywhere. Unlike black rats they were voracious predators. They could undermine shallow foundations, and they could gnaw through many building materials - wood, wattle and daub, lath and plaster, cob, even loosely jointed stone walling. Wherever one rat found its way into a dovecote others followed, and it rapidly became totally infested. To pigeon keepers their arrival in a district was a disaster. 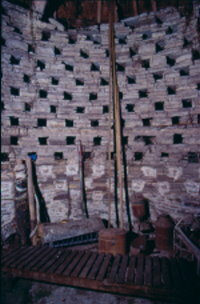 Many dovecotes went out of use at this time, and were never used again. Others were adapted in various ways to protect them from the new predators. 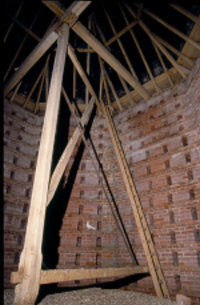 A knowledge of how this was done can help the investigator to know when a particular dovecote was built or altered. whole building original mortar was of clay. (A contemporary writer, the anonymous author of The Sportsman’s Dictionary, was writing in 1735, very soon after brown rats first arrived in England. He did not realise that a new species had been introduced, only that something extraordinary was happening with rats which placed dovecotes at risk. He advised dovecote owners to protect the buildings with various devices which later proved to be irrelevant - because he was still thinking in terms of black rats and their behaviour, which was quite different to that of brown rats. Regrettably, this book fell into the hands of Alfred Watkins, who wrote about Herefordshire dovecotes in 1890. Just to add to the confusion, he and the writers who took their information from him wrote that it was published in 1725. An enquiry at any reference library would have told them that the book was first published in 1735). 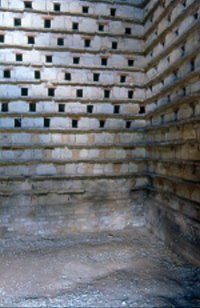 Broadly speaking, dovecotes built after the middle of the eighteenth century had blank lower walls inside, and the nest-holes began at a height of 3 - 5 feet (1 - 1.5 metres). However, there are some significant exceptions. If a dovecote was built well enough, with deep foundations, of hard stone or brick, with close mortar joints which they could not penetrate, it was inherently resistant to rats. The only vulnerable point of entry was the door, for brown rats could gnaw the edges of a wooden door and get in. Some doors were protected with iron plates, others by kenneling a dog within reach. In these cases one may find nest-holes from near ground level even in a quite late dovecote. But increasingly pigeon lofts were built over ground storeys devoted to other purposes - gatehouses, stables, tool stores, etc. As with granaries, the safest place was the upper storey of a two-storey building. Because Ferguson could find little about dovecotes in English literature he drew heavily on French sources. However, France has a quite different social history from that of Britain. Ferguson wrote that the peasants had no defence against the hordes of pigeons which descended on their fields from the dovecotes of their seigneurs. This may be true of France, but at all periods Englishmen have had the right to drive pigeons off their crops. A law of 1603 made it illegal to kill marauding pigeons, but it was normal practice to employ children to scare all birds off vulnerable crops, and this practice continued. So whenever you read that British 'peasants' were helpless against the pigeons from the lord's dovecote you may be sure the writer has copied his material from Ferguson or Cooke. 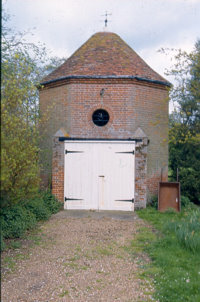 Arthur O. Cooke assumed that these revolving structures have always been available, but no evidence of their use in Britain has been found earlier than 1698. The vast majority date from the eighteenth century, and are made exactly as eighteenth-century millwrights made milling machinery. Where one is found in an earlier dovecote it is always a later introduction. They were known to contemporaries as ‘revolving ladders’. Ferguson used the word potence because he took his information from a description in French by E. E. Viollet-le-Duc. Why not use the English name? None of these errors would have been perpetuated if later writers had done their historical research independently. The trouble is, it is so much easier to copy material from another book. 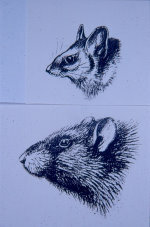 G. E. Barret-Hamilton and M. A. C. Hinton, A History of British Mammals, London, 1921. Christopher Dyer, ‘English Diet in the Later Middle Ages’, Social Relations and Ideas: Essays in Honour of R. H. Hilton, edited by T. M. Aston et al, Cambridge, 1983, 191-216. F. G. Emmison, Tudor Food and Pastimes: Life at Ingatestone Hall, London, 1964, 42. Todd Gray, Devon Household Accounts, part 1, Devon and Cornwall Record Society, 1995, xxxiii. Eric Kerridge, The Agricultural Revolution, London, 1967, 270-3, 288-91. W. M. Levi, The Pigeon, Columbia S. C., 1941, 184, 436. 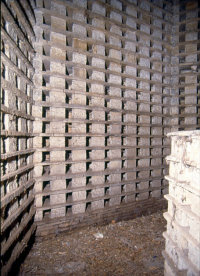 John McCann, ‘An Historical Enquiry into the Design and Use of Dovecotes’, Transactions of the Ancient Monuments Society volume 35 (1991), 89-160, and Addendum in volume 36 (1992), 137-8. John McCann, ‘Dovecotes and Pigeons in English Law’, Transactions of the Ancient Monuments Society volume 44 (2000), 34-5, 43-7. Oliver Rackham, The History of the Countryside, London, 1986, 47-52, 122-8. J. M. Ridgard (ed. ), The Household Book of Dame Alice de Bryene, Suffolk Institute of Archaeology and History, 1984. Una Robertson, ‘Pigeons as a Source of Food in Eighteenth-Century Scotland’, Review of Scottish Culture volume 4 (1988), 89-103. J. E. Thorold Rogers, A History of Agriculture and Prices, Oxford, 1866-1902. John Webb, ‘A Roll of the Household Expenses of Richard de Swinfield, Bishop of Hereford’, Camden Society volume 59 (1854) and 62 (1855). .